and Turn Them into Raving Fans! How do you attract a base of adoring admirers who crave what you offer and become your company’s devotees for life? As you may have guessed, providing great benefit to customers doesn’t occur by accident. It comes directly from using a well-thought-out value philosophy. So, what does it take to create outstanding products and services that are not only profitable, but also convert ordinary buyers into wild enthusiasts who can’t stop telling their family, friends, and colleagues about your company? Only when you avoid making these mistakes can you begin to layer on what will truly excite your buyers. But how should you go about doing these things? Luckily, I have a simple, straightforward blueprint that will walk you through the process step by step! Focus on consistent excellence to elevate your brand and attract thrilled, repeat customers! Price: US $21 Click now to get instant access! Apply four unusual, but highly effective, research techniques to investigate your target market, pinpoint who your prospects are, and determine precisely what offerings and features they crave. Explore your customers burning hassles in three powerful ways, and then transform their aggravations into highly profitable offerings that will create a formidable competitive advantage. Evaluate your products for over-complexity, and then identify exactly where to draw the line between building in useful features and creating customer overwhelm (four key approaches). Rethink your product and service specifications to robustly support your customers’ circumstances of use, including ways to be certain your offerings won't fail to function in non-ideal situations. Implement three powerful methods for testing your products  complete with step-by-step checklists  to create the smoothest possible user experiences. Ensure that your customers reactions to quality in perception do not negatively affect or undermine their views about the quality in fact that your products and services deliver. Use four potent wow factors that never fail to please buyers. These methods will propel your products and services into a league of their own! Follow my gourmet recipe for creating brand loyalty by mixing in six delicious ingredients that will set your offerings far apart from everyone else’s, and create truly exceptional customer experiences. YES, Adele  I want to order your Customer Success Kit right away so I can stop pushing my customers away and start turning them into loyal fans! 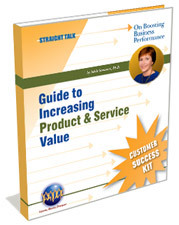 I’m convinced that this guidebook will help you transform your products and services from being lackluster, difficult, or even hazardous to use to thrilling your customers with outstanding experiences! Your customers will be unable to stop themselves from raving about your company to everyone they know, thereby creating exciting new opportunities for your business.